Great name, vintage looks and tone. ox is one of the most famous names in amplification. 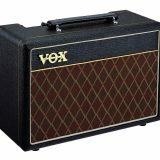 Founded in the 1940′, the Vox sound has been made famous by the Beatles, The Rolling Stones, The Edge (U2) and countless others. The Vox Pathfinder 10W combo is a vintage looking and sounding amp that won’t hurt the budget. Let’s check out the features and tone for this little ripper from a famous name in music. I like the features here, the clean/overdrive switch allow you to quickly flick between clean and overdrive. The gain control let’s you dial up the crunch and the 2 band EQ gives you some control over the tone you like. Something not quite common in this range of amps is a line out. 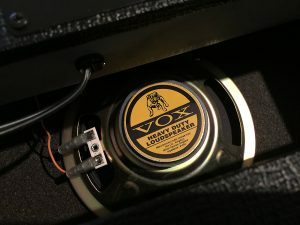 Vox say that this output is a filtered line out, suitable for recording or headphone use. When you use this output, the speaker will disengage, perfect for headphones, and also suitable to output to a recording device. A real highlight of the Vox Pathfinder is the vintage looks. Compared to other less well known brands, which can have a very generic look, the Vox has the look and feel of a vintage amp. The famous mesh front gives it a distinctive look. Vox is famous for a a bright “chimey” tone. The cleans on the Vox Pathfinder 10W are definitely bright. If you’re not a fan of a super bright tone, ease back the Treble control and it will soften. I liked to add a bit of gain to the clean tone, using the Gain control. The crunch was pretty nice, good for bluesy rhythm and lead. Engaging the overdrive switch, Vox’s distortion kicks in. The downside with a single channel amp means that if you want a super clean tone (i.e. Gain control down low), then a high gain distortion, you’ll need to press the overdrive switch AND dial up the Gain control.One way around this is to use a pedal to get your distortion, or go up a step in budget and look at a 2 channel amp. One surprise I found was that it sounds great with acoustic guitars. So if you’re in the market for an acoustic guitar (firstly, read our post here on this topic), it’s definitely worth a look. The Vox name means that you’re buying a quality product. 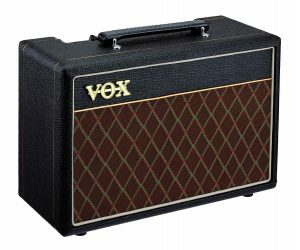 Add in a well thought out set of features…Vox speaker, made in England, overdrive selector and EQ. It’s a top little amp. The only missing feature (found in some other similar amps) is an Aux input, though I think the quality of the tone makes up for that.